Several articles on Everything Finance have addressed the task of getting your finances in order. Paying down debt, saving for an emergency fund, investing for retirement and planning ahead for short and long term spending on items such as a home, a car or travel are all very important financial to-do’s. Yet you won’t get very far with your financial goals if you don’t adopt the right attitude. Without first preparing yourself psychologically for the financial battles you are aiming to win, it’s more likely that your financial situation will not result in the growth and improvement you are seeking to achieve. 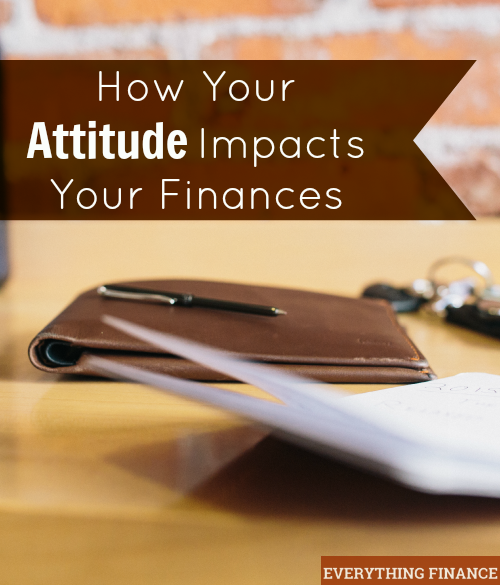 As someone who has experienced financial challenges due to being in debt, and went on to successfully pay off $55K of consumer debt, I’d like to share how your attitude can directly impact any financial goals you are working on in 2015. When I set out to pay off my mountain of consumer debt, I took some time to identify what I would earn from my efforts and why it was crucial to get the job done. Take a moment to list out all of the positive results that will be gained through your continued efforts to improve your finances. Keeping the reasons why you should continue to persevere front and center in your mind is crucial to your financial success. Without a clear purpose that defines your actions, your financial goals will consequently fail to materialize. There will be days when you may forget to track your spending or would prefer to shop instead of transferring funds to your savings account. Don’t allow your missteps to stop you from continuing with your financial objectives. I can’t say enough about the importance of positive thinking. It’s been suggested and proven that people who consistently think positively about accomplishing a goal are more likely to realize it. There are a variety of ways that you can direct positive thoughts towards your finances such as prayer, mantras, educating yourself about financial concepts, congratulating yourself for taking positive action, enlisting the support of other positive minded individuals, and practicing gratitude. Perhaps your financial circumstances are not where you would like them to be today. Remind yourself that with your consistent efforts along with time, your finances will improve. Ensuring financial progress is not only about staying focused and thinking positively, it’s about how you choose to deal with financial setbacks. Accomplishing virtually anything in life is not without its challenges. When financial adversity occurs, it’s extremely importantly to not permit negative self-talk to control the situation. Granted, some financial setbacks are genuinely troubling such as a job layoff, loss of income due to health issues, death of a spouse, or a serious car accident. Still, little can be achieved to resolve problems when you’re in a state of absolute panic. Evaluate the problem objectively and come up with realistic options that can serve as a plan of action. Seek the help of those you trust who can potentially offer solutions that you may not have thought of. Above all, know and believe that you are capable of surmounting adversity and that you are the key to your financial success. How are you planning to support your efforts to improve your finances in 2015?